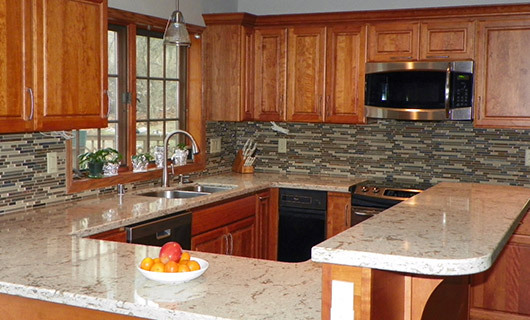 Kitchen remodels are, by far, the most popular remodel for homeowners and for good reason. The kitchen is usually the busiest room in the home – after all, it is where families gather to cook and share a meal together. While kitchen remodels are the most common type of home update, they also require the most decision making. There are many factors that go into creating a functional and beautiful kitchen and working with a custom home builder like Renz Construction means even more personalized potential for your space. We can customize every detail of your kitchen including counter height, cabinet style, stylized lighting features, and custom-built islands. Your dream kitchen does not have to be limited by big box store layouts and options. 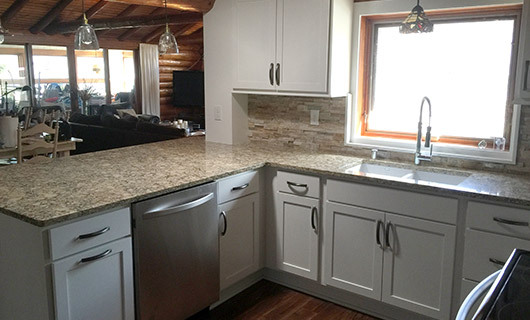 Because we are custom home builders, we have the experience to handle all sizes of kitchen remodel from new appliances, flooring, and cabinetry, to extending ceilings, taking down walls, and opening kitchens to other living spaces. There are many reasons to update your kitchen. Some choose to update their space because it is simply too outdated to function efficiently. The appliances may be old, the cabinetry falling apart, the tile cracking, or the countertops may be peeling. Flow is very important to the function and safety of a kitchen space, but outdated kitchens tend to have layouts that are counterproductive to current kitchen use. Appliances should have plenty of room to accommodate open doors, walk through spaces should be wide enough for people to move through freely with hot items, electrical outlets should be a safe distance from any water sources, and cabinetry should be reinforced to hold weight safely. Space is also a major consideration for those choosing to remodel their kitchens. Older homes are likely to have floor plans that wall the kitchen off from the rest of the home while modern trends have incorporated the kitchen into other entertaining areas to marry the two spaces. It’s not uncommon to take down a wall and replace it with a custom island that might include additional counter space, a stovetop, a dishwasher, or even a sink. Older kitchens often have lower ceilings which can feel confining. Opening up the ceiling to add height or a skylight is a great way to enhance the open feeling of the space and bring in natural light. Finally, many choose to update their kitchens once they update their appliances. They may want to upgrade that avocado green fridge or get rid of the dishwasher that just doesn’t clean like it used to. 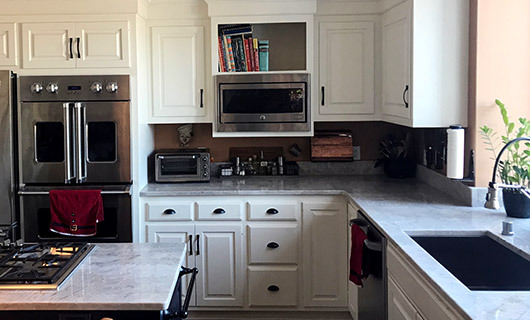 New appliances like double-door refrigerators or top-of-the-line dishwashers may be too large for the current space built into existing cabinet structures. Updates in kitchen appliances may also require new plumbing lines and electrical fixtures to accommodate updated styles and advancements in technology. If you are already investing in quality appliances, it may be time to invest in building out a space suitable for your new kitchen equipment.